Last Tuesday, Yahoo! announced Project Purple - an effort that links to its brand promise to transform the lives of people, societies and economies. Yahoo! aims to call out to all Filipinos to bring innovation and a positive change in the Philippines. Yahoo! 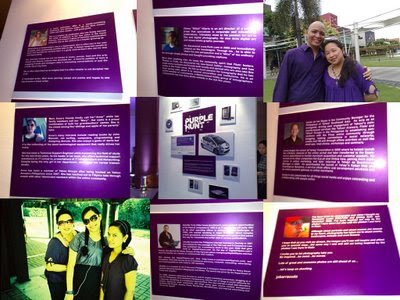 Project Purple aims to brings awareness to the things Filipinos are passionate about and how they can be found on Yahoo!. 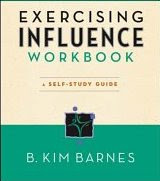 To kick off Project Purple, Yahoo! has given the treasure hunt its very own purple twist. Interesting insights about the web and the Philippines will be uncovered through the Yahoo! Purple Hunt micro-site. Participants will be asked to solve online clues and find items located around Metro Manila. Purple hunters simply need to log on to the Yahoo! 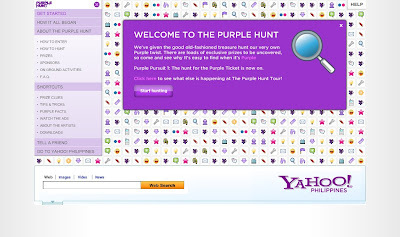 Philippines front page and click on “Purple Hunt.” The fun begins June 2 and will run up to July 25. To carry this out, six (6) Yahoo! power users were asked to help out (volunteer) during this whole duration (I am one of them). The friendship gained, despite the limited time we got together for its preparation made us also close. Cheers to Mary Anne Ablaza, Jobar Pensica, Milai Legaspi, Jonas de los Reyes, and Jimmy Hilario (got our trio girls picture from him). 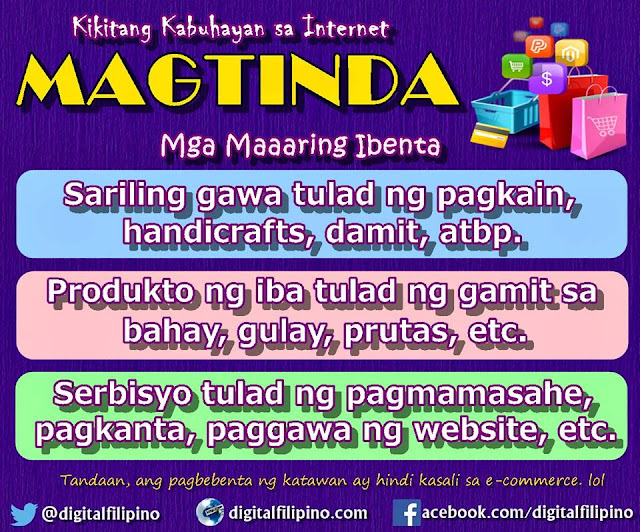 The next three months will be exciting as we interact online with Yahoo users in the country. Up for grabs are Purple Krispy Kreme doughnuts and other Yahoo! prizes like Canon digital cameras and Blackberry mobile phones specially designed by Pinoy artists. One lucky purple hunter will drive away with the grand prize—a one-of-a-kind Honda Jazz car sporting purple artwork created by WeWillDoodle. • ‘Purplize’ yourself - Watch you and your friends turn Purple with a few props and a whole lot of digital wizardry. You’ll even get a photo to remember your Purple self by! • Yahoo! Mobile Surf & Lounge Booths - Our Purple crew will guide you through Yahoo! Mobile and other online services that showcase how Yahoo! makes surfing the web and sustaining connectivity easy and fun. • Globe Broadband Tattoo Booth - Special ‘Purplized’ Globe Broadband Tattoo Pre-paid Kits will be sold! • Krispy Kreme Doughnut* Counter - ‘Purplized’ Krispy Kreme Doughnuts will be given away daily, while stocks last! • Nestle Ice Cream give-away - Nestle ice cream will also be given away daily while stocks last! Catch the Purple Hunt Tour at Market! Market! on June 5-7, at Greenbelt 3 on June 8-10, at Glorietta 3 on June 11-15,and at Trinoma on June 16-18. Popular art-based performance group, WeWillDoodle, will create a one-of-a-kind art piece using the Honda Jazz as ‘canvas.’ The first of its kind, for the group and for Honda, the purple car is one of the must-have prizes in the online treasure hunt. Just follow me to receive purple updates!